Wash and sock sago 3-4 hours. Boil potatoes and peal skin and mash it .Dry roost the peanuts and grind roughly. Take a bowl and add soaked sago mashed potatoes, grinded peanuts. Add chopped green chilies, cumin seeds, chili powder salt, chopped coriander leaves and bind them and add water if needed. Heat up a pan adds oil for deep fry. Take some water on oil on your palm and wet it now take a small portion from the dough and shape them like a vada or any other shape you want. Deep fry vada on medium flam till it turns golden brown ,drain the sabudana vada and remove the access oil. 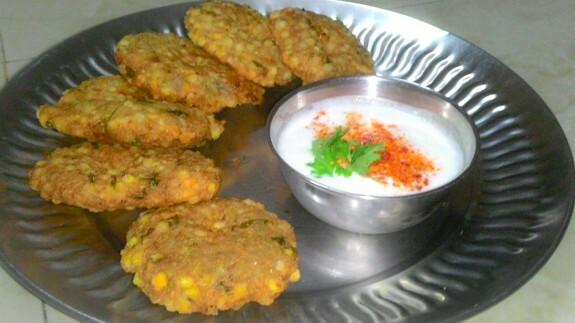 Now the Yummy and crispy sabudana vadas are ready to serve .Serving suggestion: Taste best with curd.